Cooks & Soldiers pounds the drum for Basque cuisine in West Midtown Atlanta. At first glance, the concept seems wonderfully mad: An ambitious, contemporary restaurant in Atlanta’s sizzling West Midtown, based on Basque traditions (tapas, wood-grilled meats, bone-dry white wines and spicy reds) and named for an annual festival in which an entire Spanish town pounds drums all day and night, dressed as cooks and soldiers. If Cooks & Soldiers is a bit lunatic, it’s the kind of crazy I can get behind. In practice, the labor-intensive requirements of serving small plates can get … well, crazy, with dishes often arriving willy-nilly at the kitchen’s whims rather than at the pace at which you want to dine. Here, the young waitstaff are not only knowledgeable and accommodating, they have the kind of anticipatory radar that separates them from the madding crowd. More importantly, the staff seems to enjoy what they’re doing nearly as much as the diners are enjoying their meals – and on two visits, the modern, Edison-bulbed dining room rang with laughter and constant conversation. On our first visit, a neighboring table of two women quickly educated us on their favorite dishes – and surprised us with one they thought we needed to try. On our second visit, servers from other tables gathered round to compliment us on our choices, freely offering to “help” us with them if we needed it. That this enterprise is the intersection of audacious youth and seasoned experience should be no surprise: Cooks & Soldiers is a part of the Castellucci Hospitality Group, which includes Double Zero, the Iberian Pig and suburban stalwart Sugo, founded by C&S’ proprietor’s father. Cooks & Soldiers’ executive chef, formerly of the Iberian Pig and a 2015 James Beard Rising Star of the Year semifinalist, is Landon Thompson. While many dishes are pure authenticity, like the simple grilled bread with fresh tomato and garlic with the option of Iberico ham, or the Basque omelet tapa, with onion, potato and garlic aioli, others are pure fun, like the “Chistorra in a blanket,” a little Spanish sausage tucked in a croissant, lightly cider-glazed and served with maple-mustard allioli (the Spanish version of French aioli, the intensely garlicky mayonnaise). “Like Christmas morning,” our table-neighbors whispered, after they sent it over. Like breakfast, lunch, dinner and dessert, I thought. 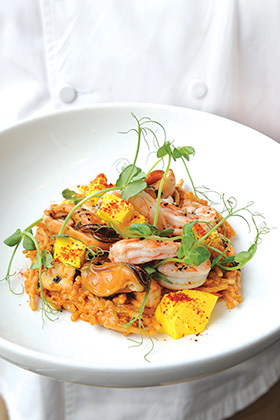 Perhaps our favorite dish of the meal, Fideuà Paella, is also traditional – Georgia white shrimp, Mediterranean mussels, sobrassada and the thin pasta called fideuà, topped with saffron panna cotta and curly pea tendrils. Trout Navarre, Georgia-sourced and cooked a la plancha (on a griddle), comes with Iberico ham, Swiss chard, hazelnut romesco and crisp potatoes. Wild mushrooms in a pork demi-glacé with sheep’s milk cheese is intensely umami-fied; wood-grilled beets and Brussels sprouts with a generous dollop of crème fraîche are hearty enough for a main dish, even without the optional crispy duck confit. Have them with the lightly sparkling Txakolina, poured from on high as if from a shepherd’s flask. Make no mistake, this is a meat-lover’s paradise – at another neighboring table, a large party dove into platters of thin-sliced ham and carvings of Chuletón, a 2.2-pound bone-in rare-centered ribeye, served with bordelaise and green salad, by far the priciest dish on the menu at $74 and meant to be shared. On our next visit, we opted for entrees rather than tapas, going for two specials: Pan-fried sturgeon, garnished with umi (sea urchin) butter and caviar and served with gorgeous chartreuse Romenesco, looking for all the world like flower buds, on a bed of puréed celery root. The Wagyu steak, deliciously crusted with bleu cheese gremolata (herbed breadcrumbs), fanned out next to wild mushrooms, white asparagus, creamed spinach and a bit of mulled wine reduction. Our favorite dessert, by pastry chef Ashley Auer, was the Gâteau Basque (Basque cake), a little sugar-crisped cake with a green-apple center, surrounded by spiced-cider apples, cranberries and almonds and a bit of caramel crème anglaise. Sometimes a little madness is just what you need. As Aristotle once said, without at least a touch of it, there is no great genius. UGA’s highly regarded farmed caviar is available in many local restaurants, whether sprinkled for a burst of flavor (as in Cooks & Soldier’s sturgeon special, mentioned above), or in full-fledged traditional service with toast points, sour cream and egg.